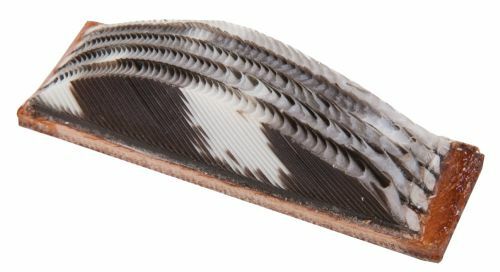 These reproductions of the original feather rests are made of wild turkey feathers installed on leather. They are adhesive backed for easy installing. Great for bow collectors or hobbyists as well as bowhunters and shooters. Add a touch of nostalgia as well as practicality to your bow set-up. Available for Right and Left handed. Please specify.Suitable for bows with a flat arrow shelf.